The deal brokered between outgoing Cape Town Mayor Patricia de Lille and the DA, which will see her leave office with the party's disciplinary charges against her withdrawn, still stands. But the Cape Town City Council is now referring De Lille to the police to face possible criminal charges as a result of a report implicating her in the cover-up of fraud and corruption. Cue the theme tune to 'The NeverEnding Story'. 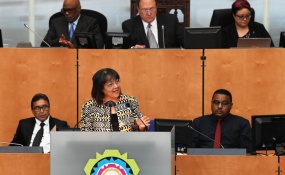 The day of Cape Town Mayor Patricia de Lille's (supposedly) final appearance in the Cape Town City Council concluded with council accepting the recommendations of two Bowmans reports into fraud and maladministration within the City of Cape Town. But if what turned into a nightmarish day for the DA is over, the Patricia de Lille saga is almost certainly not.